Josemaría Escrivá de Balaguer y Albás was born in Barbastro (Huesca, Spain) on January 9, 1902. His family on both sides was steeped in the cultural and Christian traditions of Spain, as well as colored by the personality and traditions of Aragon. In his parents –José Escrivá y Corzán and María de los Dolores Albás y Blanc– he had clear examples of faith, and of robust and sincere piety. Josemaría was a student of the Piarist Fathers of Barbastro, where he received his primary education. He also began his high school studies there, but finished them in the National Institute of Logroño, to where his family had moved in 1915. José Escrivá and Dolores Albás had their first child, Carmen, in 1899; she was followed by Josemaría and later, by three other girls. The beginning of the 1910s was a period of trials for the family, marked by the deaths of the three younger daughters and a severe economic setback that resulted in the family leaving Aragon and settling in the neighboring province of La Rioja. All this affected Josemaría, who nonetheless remained a young boy with a cheerful and open personality, who continued to apply himself diligently to his studies. One harsh winter’s day, when Josemaría was only sixteen, contemplating the footprints left in the snow by a barefoot Carmelite friar walking through the streets of Logroño, he felt a calling that he likened to a loud knock in the depths of his soul. He began to feel that God wanted something from him, though he did not know what it was. In this frame of mind, Josemaría decided to give up the professional ambition he had been considering, a career as an architect, in order to become a priest, convinced that this way he could be an instrument for the fulfillment of God’s will. A long period of faith and intense prayer followed, during which Josemaría asked God to manifest what this wish was that he had “felt” but as yet was unable to perceive. “Lord, make me see! Lord, may it be! Our Lady, may it be!” were the aspirations he repeated for many years. They well express his life of prayer and his firm determination to put into practice what God wanted. In 1918 Josemaría began his ecclesiastical studies, as a day scholar, in the Seminary of Logroño, and in 1920 he continued them as a boarder in Zaragoza. He lived in the Seminary of St. Francisco de Paula and attended classes in the Seminary, which at that time had the status of a Pontifical University. In 1922, Cardinal Juan Soldevila, then Archbishop of Zaragoza, who had become aware of Josemaría’s spiritual and human qualities, made him an inspector of the Seminary of St. Francis of Paula; this meant that for three years he had the function of Superior. Together with his theological formation, Josemaría strengthened his spiritual formation with constant reading of spiritual classics and above all, with his personal prayer: on many nights he spent long hours before the Blessed Sacrament of the Seminary church, in intimate and deeply felt dialogue with the Lord; and in almost daily visits to Our Lady of the “Pilar”, the invocation of the Virgin deeply characteristic of Zaragozan piety. In 1923, once his theological studies were well under way, and having obtained permission from his superiors, Josemaría began studying civil law at the University of Zaragoza. To do so, he first took advantage of the summer vacation periods and later, of the time he had after fulfilling his pastoral duties. Studying civil law responded to a wish manifested by his father years earlier, when Josemaría told him about his decision to become a priest. Studying ecclesiastical and civil law at the same time, his presence in the lecture rooms of the School of Law and his relationships with professors and students at this educational center constituted, no doubt, an experience that enriched his personality and prepared him for the orientation he later would have to give to his life and his activities. 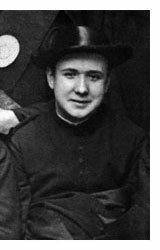 He was ordained a deacon on December 20, 1924 and received the sacrament of Holy Orders on March 28, 1925. 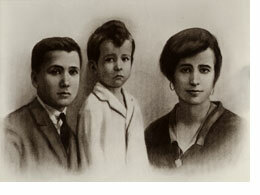 Shortly before Josemaría finished his training for the priesthood, his father died in November, 1924. The family, made up of his mother, his sister Carmen, and a brother, Santiago, born in 1919, moved from Logroño to Zaragoza where they were, to a large extent, under Josemaría’s care. Fr. Josemaría started his sacerdotal ministry in the parish of Perdiguera (of the diocese of Zaragoza), and later continued in Zaragoza. Having obtained his degree in law, Fr. Josemaría wished to continue these studies to obtain his doctorate, which was at that time only possible at the University of Madrid, which had the status of a Central University. This, together with other factors, led him to move with his family to the capital. In the spring of 1927 he settled definitively in Madrid, where he carried out unflagging priestly work, attending to the poor and helpless in the outskirts of Madrid, and especially the incurable and dying patients in the hospitals. Fr. Josemaría became chaplain of the chapel of the Foundation for the Sick, a charitable institution run by the Congregation of Apostolic Ladies of the Sacred Heart of Jesus. Preparing thousands of children for their first Confession and first Holy Communion and his visits to the poor quarters of a Madrid in full expansion, with its consequent social problems, occupied many hours in Fr. Josemaría’s intense dedication to his ministry. The need for an income with which to maintain his family led him to become a teacher in an Academy, specialized in tutoring university students in juridical studies. All this, together with constant prayer and very exacting mortification and penance, made these years a real “prehistory” of Opus Dei, that is, a period of spiritual profundity that prepared St. Josemaría to receive what God has prepared for him. On October 2, 1928, during a spiritual retreat, the Lord clearly revealed to St. Josemaría what until that moment He had only hinted at. At this moment Opus Dei was born, as a reality branded by fire on the soul of a young priest who from then onwards dedicated all his energy to this end. At first, Josemaría’s natural humility and a certain caution in the face of the proliferation of religious foundations, led him to investigate as to whether an institution such as the one God revealed to him already existed. However, from that October 2, he also began seek people who would understand this manifestation of God. He soon perceived that nothing existed similar to what God was requesting of him. Guided always by the Lord, on February 14, 1930, St. Josemaría also understood that he had to extend the apostolic work God had indicated to include women. A new way was thus opened in the Church, directed at promoting, among people of all social classes, the struggle for sanctity through ordinary secular life and the need to be an apostle in the midst of the world. It was also in 1930 when a casual question put to him by a friend (“How is that Work of God getting on?”) led him to think that this could be the name of this apostolic enterprise. The expression “Work of God” manifests, on the one hand, St. Josemaría’s profound conviction that he was fulfilling a divine wish, and at the same time expresses clearly what Opus Dei means in practice: ordinary life, professional work, converted, through prayer and personal generosity, into the work of God, into Opus Dei, work done in God’s presence, for the service of all humankind. The nucleus of the message transmitted by the Founder of Opus Dei was the announcement of a universal call to sanctification in the performance of ordinary professional work. Thirty years before the Second Vatican Council, St. Josemaría, speaking on the plenitude of Christian life, pronounced this judgment with supernatural daring: “You have the obligation to sanctify yourself. You too. Who thinks that this is the exclusive task of priests and religious orders? To all, without exception, the Lord said ‘Be perfect, as my heavenly Father is perfect'” (The Way, 291). The universal call to sanctification in one’s own work does not mean, as St. Josemaría often repeated, a decrease in the demands and of the horizons evoked, in the Christian conscience, by the word “sanctity”. On the contrary, it implies reminding each and every one of the sons and daughters of the Church that, no matter where they are, no matter what their qualities are, the words of the Gospels are addressed to them. They have all received the baptismal invitation to follow Christ. The plenitude of Christian life has to be reached by the ordinary faithful in the place and condition they have in human society, making their ordinary work an occasion of sanctity, at the service of God and of their fellow human beings, in imitation of the hidden life of Christ. This was the message which from October 2, 1928, the Founder of Opus Dei spread and which drew to him a group of people, small at the beginning, but which was destined to grow. Meanwhile, the social context of St. Josemaría’s life underwent changes and tensions. The economic situation of his family continued to be difficult. His pastoral ministry also changed. In 1931, St. Josemaría left the Foundation for the Sick and assumed the task, first as Chaplain and later, in 1934, as Rector of the Royal Foundation of St. Elizabeth. There, in the sacristy of St Elizabeth’s, after especially intense personal prayer, St. Josemaría put into writing what was one of his first books: some commentaries on the mysteries of the Rosary, which were published in 1934, under the title of Holy Rosary. St. Josemaría also began writing in his notebooks some conclusions or snippets of his personal prayers, with accounts of experiences that had arisen in his apostolic work. Gathering together some of these intimate notes, in 1932, he composed a collection of thoughts or points for meditation which he entitled Spiritual Considerations; these, first published with the help of a duplicator and later in printed form (1934), were helpful in his apostolic work and that of those who followed him. Revised and completed with other points, these meditations were published as one of St. Josemaría’s best known works: The Way (Camino). First published in 1939, it has been translated into numerous languages and has sold millions of copies.